I lay in the operating room post-cesarean section, elated to hear the cry of my first-born son, Ryan, eager to meet him. I could not wait any longer to see his beautiful face, and to hold him wrapped in a newborn swaddle. ​ Did he look like me? His Dad? Or maybe he was a combination of both of us! As I waited in sweet anticipation, all I could think was…what on earth is taking so long for them to reveal my precious newborn to me!!! I heard whispers and murmurs from the physicians and nurses in the cold room. Things like “protein deficiency” and “Epidermolysis Bullosa” and “skin” and “malformed nails”. Instead of being able to admire my bundle, I stole a quick glimpse of him before he was whisked away to the NICU with no formal diagnosis. He was left naked and abandoned in an incubator, with no human contact or ability for me to see him for several hours after he was born. He lay there like a leper, screaming, nobody knowing quite what to think, or what to do with him, how to hold him, and worse yet, IF they should allow ME to hold him. It was this inability to embrace my newborn like a “normal parent” that has cultivated the type of EB Mom I am today. We don’t let people tell us how to live life with a chronic illness, and WE as a family do not let EB define us. We are an integral part of a health care team helping navigate the treatment plan as we live our lives to the fullest extent possible…as “normally” as possible. We don’t tolerate people saying “YOU CAN’T.” Rather Ryan repeatedly proves how he “CAN.” We were told Ryan wouldn’t live to be 1. He’s 10. We were told that he couldn’t walk. He walked, albeit with help. No organized sports? Not a chance…Ryan played 2nd base for the town’s challenger league. We were told that he couldn’t attend school. He receives the highest of marks. We were told he wouldn’t be able to write because of blistering and hand webbing. He has the most beautiful hand-writing and can type as well. 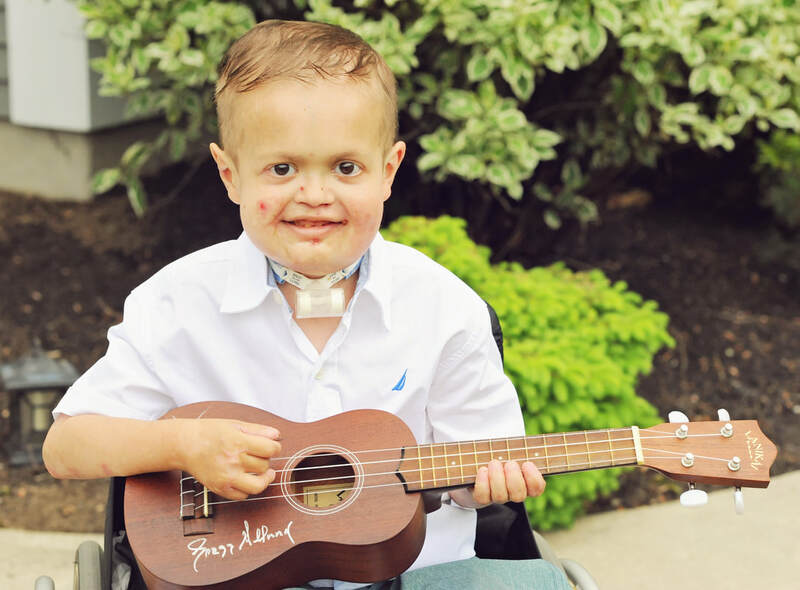 We were told that he wouldn’t be able to talk with his tracheostomy. Not only does he talk softly, he sings, and has the most amazing vocabulary. Ryan captures most everyone’s heart and soul. Just look into his eyes and you will be a believer in his strength and determination. Rather than focusing on how EB has provided challenges for us, we focus our energy on a positive outlook on life, and how our lives have been enhanced with supportive people, organizations, and people who really care. Although, a positive attitude doesn’t mean EB isn’t overwhelming. It is. To see your child having to withstand painful dressing changes and endure every day obstacles is disheartening. Let’s put a stop to this devastating disease. Find a cure. Heal EB.